On a recent trip to Hartford, CT we stopped by Hartford Denim Company (HARDENCO) to check out all of the beautiful denim, canvas, and leather wears that they produce right in the Nutmeg State. We immediately had the idea to team up for a limited edition leather coaster. 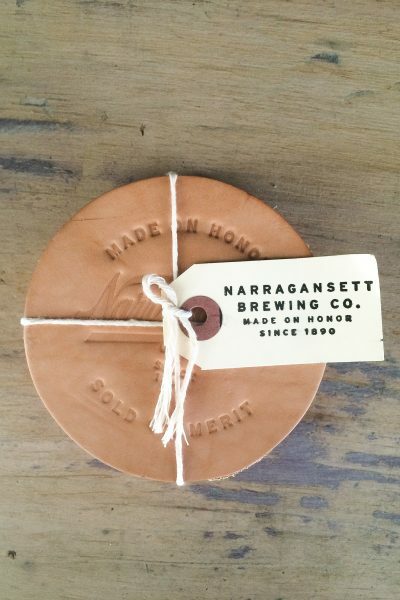 Well, one thing lead to another and we decided to release a series of small-run leather coasters. Once these are sold out, look for a new design in our store! This 4-pack of premium leather coasters are hand cut, pressed, and finished. We only made 100 sets, and once they’re gone, they’re gone. You can pick up your own here while they last: ‘Gansett Shop. Join Us for American Craft Beer Week!